It's been a pretty heartbreaking weekend. 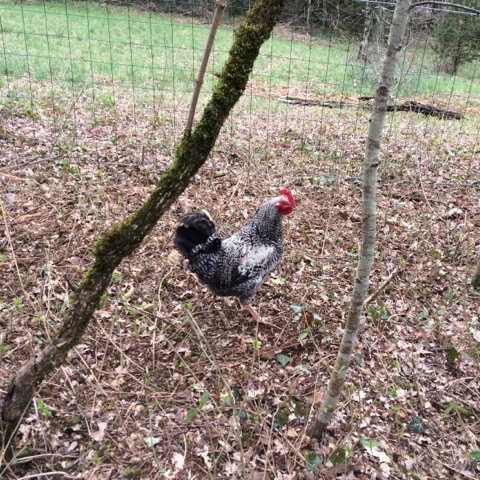 Our flock of chickens has been devastated by some animal who has killed all except one, now lonely, cockerel. I thought things were a little quiet on Sunday morning and went to check on them as usual. What I was met with was a mass of dead chickens (I'll spare you the gruesome details) and one lone, slightly bemused cockerel, wandering around amongst them. This has happened before, and we feel rather guilty as it was our fault once again for not closing the door to the hen house at night, despite the fact that they are now enclosed with fencing all around them. Three are missing, and part of me hopes they'll still wander home at some point. I get it...it's all part of nature and living in the countryside. It's a sure sign of Spring to see all the animals returning and finding food. I would understand it more however if it was killing just for food. But to kill all that it finds seems more like a game, and that seems unnecessarily cruel. The kids were sad, we are all still sad, but for the sake of Ivor the Survivor, as our remaining cockerel is now named, we'll carry on with a new brood soon.